Is it possible that in its setting and unbelievable vistas, Choquequirao is equal to or even more beautiful than Machu Picchu? As you sit on the small hill perched above this ancient city, watching wisps of cloud fly by at arm’s length and condors soar high above, with snow-capped peaks all around and the Apurimac River raging over a mile below you, we think you’ll agree. Choquequirao, often called Machu Picchu’s sister city, is the most remote of the major Inca sites, and no doubt the fact that one must hike for two days to arrive there has kept it from achieving the fame it so deserves. But it is this remoteness which keeps it so pristine, with orchids and other flora in abundance and the possibility of seeing as many condors as people along the trail. It is truly one of the world’s special places, and we are immensely proud of the opportunity to share it with you. Besides the trek to Choquequirao, our trip includes one day in Cuzco, one day in Lima, and two days within the Machu Picchu sanctuary. Day 1: Arrive into Lima. Included city tour today or upon your return. Day 2: Flight to Cuzco – city and ruins tour. Day 4: Free time at Machu Picchu, return to Cuzco in the afternoon. Day 10: Morning flight to Lima. International flights may depart any time after 3pm. A beautiful early morning train journey across the high plain above Cusco then down the Urubamba Valley to majestic Machu Picchu. Known as one of the greatest architectural achievements in the world, this historic sanctuary is considered one of the seven manmade wonders of the world. After a guided tour, take time for independent exploration of this magnificent site. Overnight in Aguas Calientes the town below Machu Picchu. Return by early afternoon train to Cuzco where you’ll have the day free to rest, explore or make preparations for our trek beginning tomorrow. This morning we head out of Cuzco to the tiny, picturesque village of Cachora, the starting point of our trek. We’ll take it easy today, walking generally downhill for about six hours. Shortly after leaving the village, we’ll find ourselves skirting a ridge high above the Apurimac River, with a stunning line of glistening white peaks, the Salkantay range, directly across from us. Our trail then takes us winding into the vertiginous Apurimac Canyon. Flora varies according to the season, but orchids, giant blooming agaves and entire hillsides covered in a carpet of blue and purple flowers are some of the things we may see. The views are spectacular from the start on this trek. The campsite is near the raging Apurimac River. This morning we cross the Apurimac and ascend for a couple of hours to the small farm of Santa Rosa, where a welcoming glass of chicha, traditional Andean corn beer, often awaits us. Afterwards we climb for approximately three more hours up lush, verdant hillsides and past gushing waterfalls before relaxing for a late and well-deserved lunch. From here it is just a two-hour, mostly level hike to the ruins of Choquequirao. We set up camp just outside the ruins. 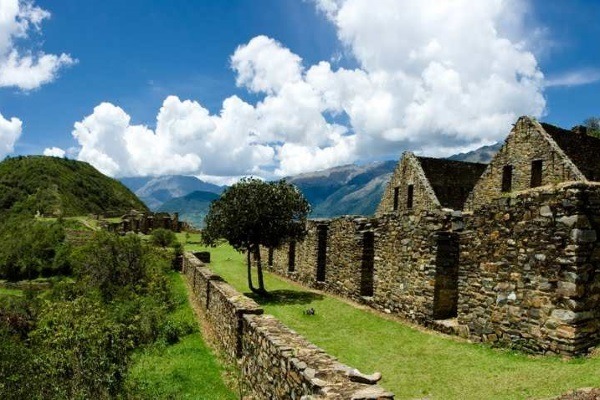 Today is dedicated to exploring the incredible ruins of Choquequirao. Nearly as large as Machu Picchu and many would say in a more stunning location, Choquequirao was never discovered by the Spanish conquistadors. 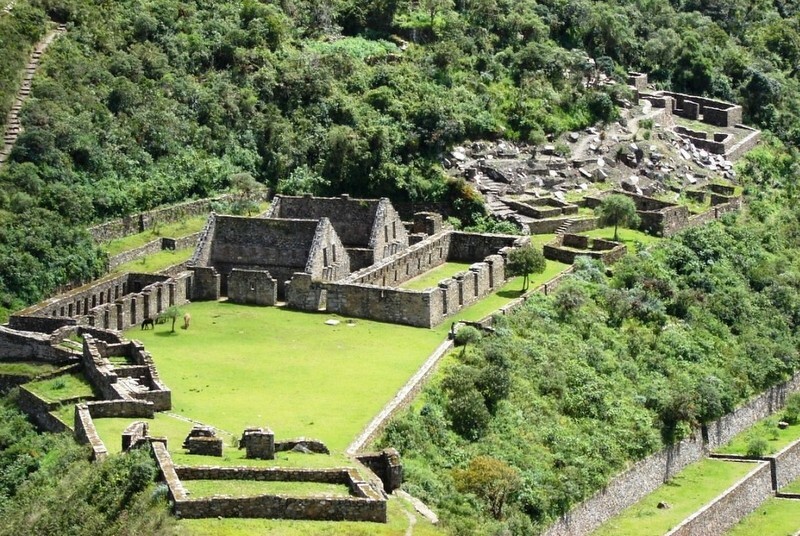 It was probably one of the “royal estates” of the Incas and served as a gateway to the wild Vilcabamba region beyond. It was also likely used as a base from which to attack the Spanish on the road from Cuzco to Lima during the Inca rebellion of the 1500′s and may well have held Spanish prisoners. Today, the site is only partially cleared, allowing us to see many of the delicate and beautiful aspects of Inca architecture while also allowing us to “play Indiana Jones” and discover many constructions still buried in vegetation. Our guide will explain the history and importance of the site. Afterwards you will have free time to visit the many sectors of the complex and watch for condors which frequent the site. Same campsite, just outside the ruins. After breakfast we begin our return trek with a steep descent on an Inca trail to the Apurimac River. Afterwards we ascend towards the village of Pumapata, camping near the fascinating ruins of an old colonial hacienda. A gentle ascent up a small, colorful canyon to the village of Pumapata, where we’ll catch our private transport back to the comforts of Cuzco. Dinner and a night out to celebrate a successful adventure! Morning flight to Lima. International flights may depart any time after 3pm. This trip includes five days of trekking of approximately the same difficulty as the classic Inca Trail. No trekking experience is required, but one should be in good physical health with no serious heart or respiratory conditions and ready for a serious hike. Anyone is welcome on this trip; those over 60 should receive a medical check-up and doctor’s approval within six months of the start of the trip. As always, a certain patience is required for the inconsistencies and occasional delays of developing-world travel. Private airport pickups – at the beginning of trip and drop off at end of the trip. Domestic flights – Lima-Cuzco, Cuzco-Lima. 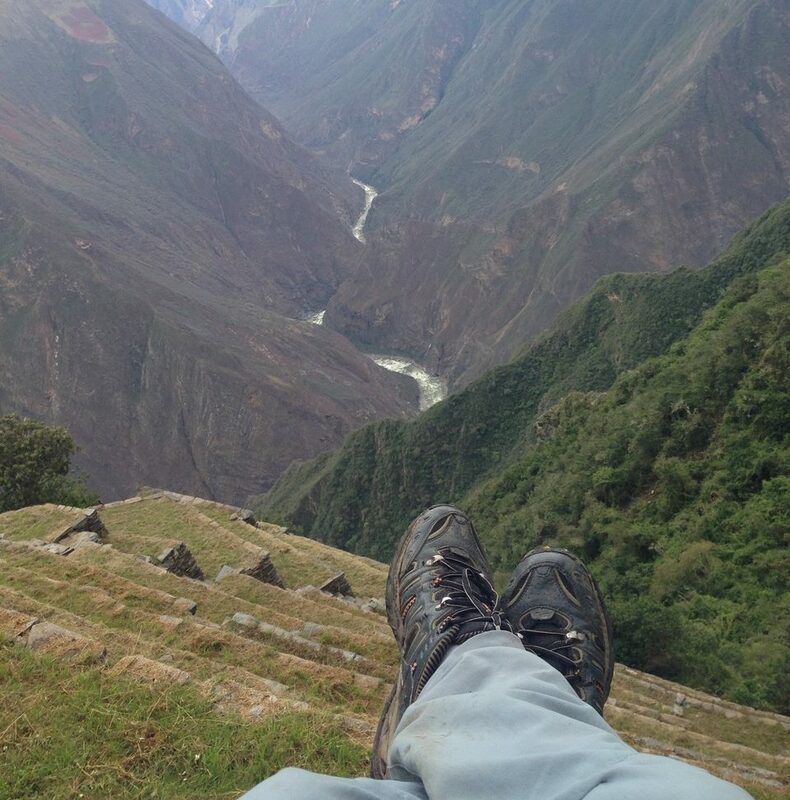 Trek to Choquequirao – including bilingual guide, Choquequirao entrance fee, food, personal cook, tent, sleeping bag and sleeping mat. Five breakfasts, five lunches, and five dinners on our trek to Choquequirao. Breakfast – included with all hotel stays. The Cuzco Visitor’s Ticket – which includes entrance to the ruins in and around Cuzco and the Sacred Valley, and many churches and museums in Cuzco. Private Machu Picchu excursion – including bilingual guide, round trip train fare, transportation to/from ruins/Aguas Calientes and one-day entrance to the Machu Picchu sanctuary including Wayna Picchu or Machu Picchu mountain entrance. This tour includes mostly 2 star hotels. We would be happy to give you an upgrade to three, four or five star. Please ask then we will work it into your custom itinerary. It is best to bring from home such items as prescription medications, eyewear and care, unusual film and camera batteries. Please bring used batteries home to recycle! Cuzco: days are warm if sunny, slightly chilly if cloudy. Nights are chilly in Cuzco. Trek: all ranges of weather from hot desert at the bottoms of canyons to possible snow and rain at higher elevations. Most people trek in shorts or light pants (synthetic, fast-drying fibers are preferable to cotton) and a t-shirt, and carry a layer or two (thin fleece and micro-fibers are, again, preferable to cotton), plus a poncho or other rain gear. There are some biting insects on sections of the trail, so even in warm weather some people opt to cover more skin with a long sleeve t-shirt and long pants.